This government’s deconstruction of the Bill of Rights and Constitution since 9/11/01 has been outright oppressive and downright criminal. It has managed to make a complete mockery of Amendment IV and Amendment I, and now the 109th Congress has seen fit to ignore Amendment X in a grandstanding political maneuver so patently absurd it bares serious scrutiny by the members of this republic. The Terri Schiavo case is the very reason I repeatedly tell friends and colleagues to read their constitution. Read it every day. Download it off the Internet, take it out of the library, buy a hand pocket version of it, and get to know it well. It is all that stands between you and government tyranny or the wonton desires of fanatics. And this, my friends and colleagues, is the age of King George and the God Fascists. The Enlightenment is in a shambles. Superstition and false morals have invaded the system like parasitic vermin. Get it in writing, team up the lawyers, and be willing to fight dirty. This is no time for outrage or long-winded speeches. This is a time for reflection and reaction both personal and public. It is time we put our houses in order, ready our muskets and wait for the hordes to come charging over the mountain, because they have long begun their ascent, and it does not look to be abated by law or reason. Know this: Elections and sedition are for sheep. Wolves earn freedom. It’s time for a serious uprising. The blind audacity of the federal government to halt its tasks for the will of the people and suspend the law of the land while the president of the United States rushes in at the eleventh hour to sign law based on an individual case of state rights is martial law. Period. The irony is that this is a Republican run federal government, which claims in its stringent platform to defend state rights and reduce the powers of the federal government. Whle you chew on that one let me take a moment to point out that I do not agree with the actions of the subject’s husband. He doesn’t want to divorce this poor woman, so he demands she starve to death? This is a murder of convenience. This is not a mercy killing. If someone is unable to function and has a living will that stipulates they want to pull the plug, so be it. This is not one of those cases. Also, I would like to make clear I do not agree with the woman’s parents either. By law, and this is why I am so adamant that the denial of basic civil rights to gay marriage is so egregiously unconstitutional, a spouse has full and complete rights. This is not negotiable, nor should it be. The Terri Schiavo case is the very reason I repeatedly tell friends and colleagues to read their constitution. Read it every day. It is all that stands between you and government tyranny or the wonton desires of fanatics. But make no mistake; this is a clear case for the state’s court system. This is why we have it. Checks and balances. Simple civics. Look it up. The federal government has three basic functions, uphold the constitution, protect the borders and deliver the mail. One out of three is not good enough. The funny thing is the federal government’s failure to protect the borders on 9/11 has caused it to usurp power and enact crazed laws all over the joint, from the vague terminology of the Patriot Act to the loosely translated use of the military. These leans on civil liberties are not ideological – conservative nor liberal, they are unconstitutional. They are above the law. Just like congress sticking its nose in Major League Baseball over drug abuse when dozens of businesses in this country piss all over the environment, create new and improved toxins for us to inhale and ingest, openly steal money from stockholders and farm out manufactured labor to Dickensian work camps all over the Third World. How about the FCC imposing $500,000 fines for ambiguous indecency standards while huge foreign conglomerates own 70% of the airwaves and the White House infiltrates news programming with fully-produced propaganda schlock? Am I the only one who is incensed at these sanctimonious cretins pointing fingers and riling up the locals on certain issues, while blatantly ignoring others? 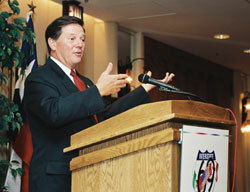 Am I the only sap who gets miffed when shitheels like Tom Delay run roughshod over the ethics of his office while working diligently to block an investigation, and then has the unmitigated gall to stand before the American people and talk about morals as if he invented them? I’m also not amused at this nonsense about the sanctity of life. Oh, boy, these phonies can’t wait to wave that tattered flag at you. Then you realize that 40 million Americans are currently denied health care and their government has done nothing to even investigate it. They did manage to pass a Medicare bill last year that handed the pharmaceutical companies a blank check, but that was when morals took a back seat to Calvin Coolidge’s axiom that “the business of America is business”. All this noise about Terri Schiavo is just that, noise. It has no legal merit, and morally it is thorny and sad. I detest the details as much as the next guy, but she should not be a political football for the federal government. This incessant meddling and horseplay with its power and reach has gone above and beyond for too many consecutive months to let it stand much longer. And although I am all for the federal government intervening when an entire race of people are denied civil rights, it is not for the government to intercede on the behalf of one person who does not effect the general populace. Finally, if I may be so bold, it needs to be mentioned that Shiavo is in this condition because she was a world-class bulimic, resulting in heart failure and irreversible brain damage. She destroyed herself by her own free will, kind of like an alcoholic or a junky. And I ask you, how much of a furor would the Moral God Police be whipping up if this were a hobo junky from Harlem? Now, let’s all hop off the high horse and get back to screwing up Social Security reform and spending our money like drunken sailors.